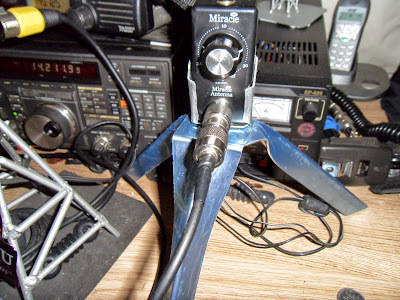 Since I got the FT-817 and Miracle antenna I have been pondering over a few ideas that I would like to try whilst out and about in the great outdoors. 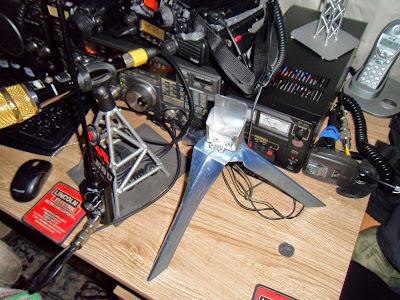 One of the ideas was to make a light weight tripod type of mount, that would allow the Miracle antenna to be used with feeder rather than a direct chassis mount. I wanted something that I could mount inside my rucksack that would stick out of the top just enough to mount the antenna clear of my head and body. I also wanted something that could be placed on a wall, rock or flat spot quick and easy. With this in mind I set about the task and came up with this. I made the tripod with the intention of standing it on Trig Points that are located nearby on the Moor top at high spots and summits. 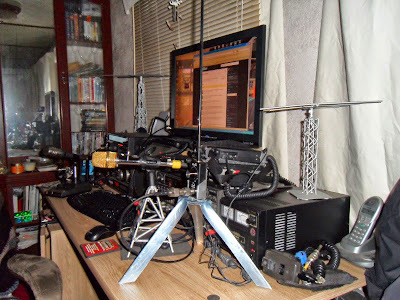 The tripod also sits well on my shack desk where earlier I heard the ARRL DX News coming in 5/7 on 14.275MHz with the little Miracle antenna, set up as seen here. Close Up of the aluminium cradle and tripod which has been riveted together using 4.8mm long reach rivets. The new tripod mount is very light and easy to use, I made it from 2mm aluminium which I folded into shape. The three legs and cradle are joined together using rivets. Total build time was less than 30 minutes. I hope to get out over the coming weekend and work some QRP contacts using the new kit, with a bit of luck there may be a video showing the results.